When a user is migrated from on-premises to the cloud (whether to Skype for Business Online or to TeamsOnly). By default, MMS is automatically triggered in each of these cases, although admins can disable it at the tenant level. In addition, admins can use a PowerShell cmdlet to manually trigger meeting migration for a given user. The ability to convert Skype for Business meetings to Teams meetings and the ability to update existing Teams meetings to modify audio-conferencing settings is currently limited to TAP customers only. Microsoft expects to make this functionality available to all customers sometime in May 2019. The user’s mailbox is hosted in Exchange on-premises. The user is being migrated from the cloud to Skype for Business Server on-premises. In these situations, end users can use the Meeting Migration Tool to migrate their own meetings instead. It searches that user’s mailbox for all existing meetings organized by that user and scheduled in the future. Based on the information found in the user’s mailbox, it either updates or schedules new meetings in either Teams or Skype for Business Online for that user, depending on the exact scenario. In the email message, it replaces the online meeting block in the meeting details. It sends the updated version of that meeting to all meeting recipients on behalf of the meeting organizer. Meeting invitees will receive a meeting update with updated meeting coordinates in their email. From the time MMS is triggered, it typically takes about 2 hours until the user’s meetings are migrated. However, if the user has a large number of meetings, it might take longer. If MMS encounters an error migrating one or more meetings for the user, it will periodically retry up to 9 times over the span of 24 hours. MMS replaces everything in the online meeting information block when a meeting is migrated. Therefore, if a user has edited that block, their changes will be overwritten. Any content they have in the meeting details outside of the online meeting information block won't be affected. Only the Skype for Business or Microsoft Teams meetings that were scheduled by clicking the Add Skype meeting button in Outlook on the Web or by using the Skype Meeting add-in for Outlook are migrated. If a user copies and pastes the Skype online meeting information from one meeting to a new meeting, that new meeting won't be updated since there is no meeting in the original service. Meeting content that was created or attached to the meeting (whiteboards, polls, and so on) won't be retained after MMS runs. 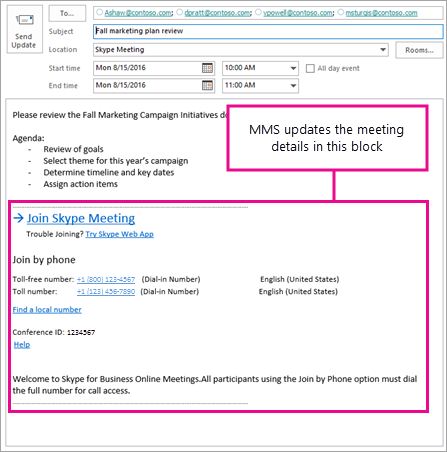 If your meeting organizers have attached content to the meetings in advance, the content will need to be recreated after MMS runs. The link to the shared meeting notes in the calendar item and also from within the Skype meeting also will be overwritten. Note that the actual meeting notes stored in OneNote will still be there; it is only the link to the shared notes that is overwritten. Meetings with more than 250 attendees (including the organizer) won't be migrated. Some UNICODE characters in the body of the invite might be incorrectly updated to one of the following special characters: ï, ¿, ½, �. If the MoveToTeams switch in Move-CsUser is specified, meetings are migrated directly to Teams. Use of this switch requires Skype for Business Server with CU8 or later. Otherwise meetings are migrated to Skype for Business Online. In either case, if the user has been assigned an Audio Conferencing license before being moved to the cloud, the meetings will be created with dial-in coordinates. If you move a user from on-premises to the cloud and you intend for that user to use Audio Conferencing, we recommend that you first assign the audio conference before you move the user so that only 1 meeting migration is triggered. Currently the ability to migrate meetings directly to Teams via the MoveToTeams switch is only available in TAP. If you are not a TAP customer and the MoveToTeams switch is specified, the user will be moved to TeamsOnly mode, but the meetings will be moved to Skype for Business Online. Even though the user is in TeamsOnly mode, they can still join any Skype for Business meeting. When you assign or remove a Microsoft Audio Conferencing service license to a user, and that user is not enabled for a third-party audio conferencing provider. When you change the audio conferencing provider of a user from any other provider to Microsoft, provided the user is assigned a Microsoft Audio Conferencing license. For more information, see Assign Microsoft as the audio conferencing provider. Also note that support for third party audio conferencing providers [ACP] is scheduled for end of life on April 1, 2019, as previously announced. When you enable or disable audio conferencing for a user. When you change or reset the conference ID for a user configured to use public meetings. When you move the user to a new audio conferencing bridge. When a phone number from a audio conferencing bridge is unassigned. This is a complex scenario that requires additional steps. For more information, see Change the phone numbers on your audio conferencing bridge. When you change your organization's meeting URL using the Update-CsTenantMeetingUrl command. This section describes functionality that is currently only available to TAP customers. Microsoft expects to make this functionality available to all customers sometime in May 2019. By default, meeting migration will be automatically triggered when a user is granted an instance of TeamsUpgradePolicy with mode=TeamsOnly or mode= SfBWithTeamsCollabAndMeetings. If you do not want to migrate meetings when granting either of these modes, then specify MigrateMeetingsToTeams $false in Grant-CsTeamsUpgradePolicy. Meeting migration is only invoked when you grant TeamsUpgradePolicy for a specific user. If you grant TeamsUpgradePolicy with mode=TeamsOnly or mode=SfBWithTeamsCollabAndMeetings on a tenant-wide basis, meeting migration is not invoked. A user can only be granted TeamsOnly mode if the user is homed online. Users that are homed on-premises must be moved using Move-CsUser as previously described. Granting a mode other than TeamsOnly or SfBWithTeamsCollabAndMeetings does not convert existing Teams meetings to Skype for Business meetings. Using TargetMeetingType Current specifies that Skype for Business meetings remain Skype for Business meetings and Teams meetings remain Teams meetings. However audio conferencing coordinates might be changed, and any on-premises Skype for Business meetings would be migrated to Skype for Business Online. Using TargetMeetingType Teams specifies that any existing meeting must be migrated to Teams, regardless of whether the meeting is hosted in Skype for Business online or on-premises, and regardless of whether any audio conferencing updates are required. The Start-CsExMeetingMigration cmdlet is available to all customers, but the new TargetMeetingTypeParameter is currently only functional for TAP customers. Using Windows PowerShell, you can check the status of ongoing migrations, manually trigger meeting migration, and disable migration altogether. You use the Get-CsMeetingMigrationStatus cmdlet to check the status of meeting migrations. Below are some examples. To get full details of all migrations within a specific time period, use the StartTime and EndTime parameters. For example, the following command will return full details on all migrations that occurred from October 1, 2018 to October 8, 2018. Get-CsMeetingMigrationStatus -StartTime "10/1/2018" -EndTime "10/8/2018"
For each affected user, run the Meeting Migration Tool to manually migrate their meetings. Have the users create new Skype meetings. Disable entirely for the tenant. Disable only for changes related to audio conferencing. In this case, MMS will still run when a user is migrated from on-premises to the cloud or when you grant TeamsOnly mode or SfBWithTeamsCollabAndMeetings mode in TeamsUpgradePolicy. To see if MMS is enabled for your organization, run the following command. MMS is enabled if the MeetingMigrationEnabled parameter is $true.